Why to Choose Outsource Litigation Support Services from India? 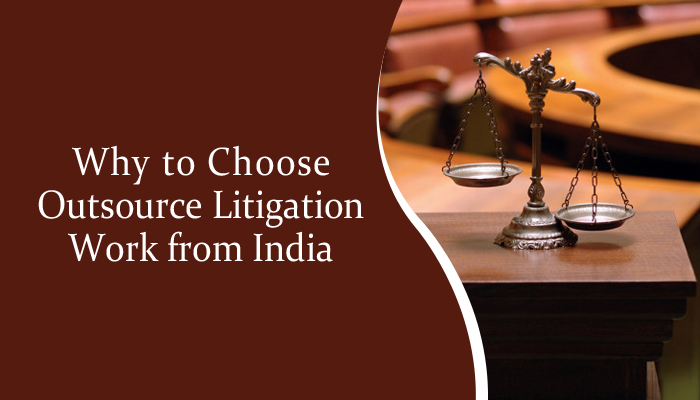 Why to Choose Outsource Litigation Support Services from India? Why Outsource Litigation Support Services from India? In the modern business environment, there is a distinct shift to outsourcing so as to lessen the burden of attending to noncore activities. So far as the legal scenario is concerned, law firms get the best of services from outsourcing agencies while their total focus remains on core competencies. One of the primary doctrines of core competencies is a high level of customer service and attending to fresh high-value business. All these will be diluted if law firms have to concentrate on such mundane and tedious tasks as research, documentation and routine claims classification. By spinning these off to litigation support services law firms are assured of increasing business turnover and earnings. However, the selection process for a top of the line legal outsourcing agency has to be decided after a great deal of due diligence. The advantages of choosing one over the other have to be carefully weighed before a final decision can be arrived at. But whatever way one may look at it, India has emerged today as the hottest outsourcing destination for legal services and not without reason. The country offers top of the line facilities in terms of competency levels, infrastructure to cope with any eventualities and a cost structure that is highly beneficial. A detailed overview will, therefore, be in order to understand fully why law firms should outsource litigation support services from India. 1. Quality of services – Indian legal process outsourcing services (LPOs) hire only the best litigation professionals, lawyers, and paralegals who are always updated with legal developments all over the world. They are fully aware of amendments and changes to the existing regulations and are in tune with the global law and its many ramifications more so for that existing in the USA, the UK, and Europe. Indian legal luminaries have the professional expertise to handle it all irrespective of the complexities of LPO services outsourced to them. 2. Converting data into an organized database – Having large volumes of unorganized data is often the bane of legal firms all over the world. Litigation services in India will go through legal documents, agreements, contracts, and presentations and extract only the relevant portions that need to be used to create a well organized and searchable database. Legal firms need not waste time and energy in wading through reams of data to look for any information. 3. Speed of services – The time zone difference of almost 12 hours with India ensures that the work sent at the close of business by the law firm gets processed during the day in India and transmitted back so as to be in the system by the opening of business hours next day. Such superlative and quick services will definitely result in business growth and expansion. 4. Minimum operating costs – Outsourcing litigation support services to India can drastically reduce the operating costs of law firms. Manpower costs are low and there is no need to invest in setting up an infrastructure for data processing and in advanced software and technology. This results in increased profitability. Read Also: Does Outsourcing Litigation Services Impact Law Firms Efficiency? Legal firms outsourcing to India, therefore, stand to reap immense benefits without losing out on the quality of services they have to offer.